Exciting news out of Canton as the Pro Football Hall of Fame is sponsoring the first annual Coaches Summit on the weekend of June 22-24. FirstDown PlayBook is going to hit you up with more detailed information about this next week but here’s what you need to know right now. FirstDown PlayBook understands that there are so many different facets to being a coach and particularly a football coach. We all love to coach ball and to get the best out of our players. We all love the X’s & O’s and the chess match that our game of football often becomes. But you know what we all love or we better love if we are going to be a good coach? The kids. That’s right, without the kids, the players, the team, there is no coach, there are no coaches. That’s a lot of what this weekend is about. The kids are changing. They always have been and they always will be. It’s our job as coaches to keep up with them, especially if you are ever thinking of becoming a head coach and helping an entire team with their goals and dreams on and off the field. 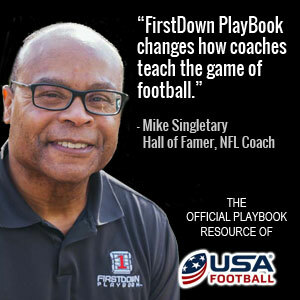 When we heard about this Coaches Summit our question was “How can we be a part of it?” So fast forward to today as we are excited to announce that every coach that attends the Pro Football Hall of Fame Coaches Summit will receive a free one year membership to FirstDown PlayBook! As if this weekend wasn’t powerful enough you will also have access to the number one digital football playbook on the planet. A little inside information here, they are only taking around a hundred coaches so don’t wait. Bang on the promotion below and get signed up today!